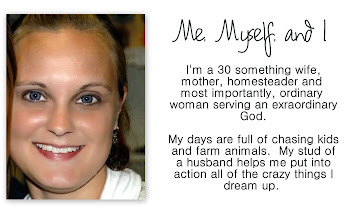 Homesteading Wife: A Letter to my 20 Year Old Self. Don't feel bad when you choose marriage over finishing school. Someday you will realize that what you truly want to be when you grow up, no school has a degree for. You will also realize that Mom was and is right... well... 99% of the time. Take good care of your clothes, you may end up wearing them for a long, long time. Don't stop exercising, please, don't stop. Bad things happen when you get older and have children, and it's really hard to get into healthy habits. When you feel the urge to get cable TV, don't. It's a waste of time and money. When I look back at all the wasted hours siting in front of that stupid screen I am embarrassed. (Unless you do it while exercising, then it's alright) Lastly, but most importantly, God has some incredibly huge things in store for you. Be patient, faithful, and always, always pray. He will answer your prayers in the most amazing ways. PS: Don't even think about getting that perm! I just love it Christina! Thanks for putting a smile on my face this morning! I love this idea! Wonderful letter to 20 year old self. Would you mind 'just blind copy' and send it to my 20 year old self too. Although, I'm pretty stubborn and don't know if I'd listen.But it's worth a shot! Thanks.